On a rainy day in Georgia, Rory McIlroy swept into contention for a coveted title with a third round 65 in the US Masters at Augusta National. It left him three strokes behind the leader, Patrick Reed, whose length and bravery delivered a priceless dividend of two eagles from famously reachable par-fives. Reed will also be familiar as the hot-blooded American who beat McIlroy in the top Ryder Cup singles at Hazeltine National two years ago. It was something of a relief that a threatened afternoon thunderstorm failed to materialise. Rain was never far away, however, and enough of it fell in the morning to render notoriously difficult greens a lot more receptive than the organisers would have wished. Which made for a wonderful scoring spectacle, where controlled aggression yielded rich rewards. While Reed revelled, McIlroy picked up the gauntlet with long, straight driving and some delightful approach play. Crucially in such circumstances, the Holywood star kept the momentum going with priceless, saving putts, like a nine-footer for a par on the treacherous, short 12th, where his tee-shot came to rest in sand. But a par wasn't his objective when an over-hit second landed in azaleas behind the long 13th green. And the error acquired telling emphasis minutes later, when Reed eagled the hole to cement his hold on the lead, before stretching it with another eagle, two holes later. Shots very different in nature on the outward journey, stood apart in McIlroy's surge towards the top. The first was a superbly struck iron to two feet for a tap-in birdie at the short sixth. Two holes later, a fairly zealous pitch from off the right of the eighth green, raced against the flag and into the hole for a spectacular eagle three. Meanwhile, there was inescapable irony in seeing Tiger Woods and long-time rival, Phil Mickelson, languishing in the lower reaches of the overall scoreboard while 60-year-old Bernhard Langer moved above them, when with a truly remarkable 71. Still, after two opening bogeys, Woods battled admirably for a level-par 72 in steady morning rain. A sometimes vexed relationship between himself and Augusta National, brought to mind a charming incident from 20 years ago, when 74-year-old Jackson Stephens was set to retire as chairman. Asked prior to the 1998 Masters how they would respond if defending champion Woods blitzed the course again, the Arkansas billionaire calmly replied: "I guess we would anoint him." This time, there will be no belated Easter anointing. Woods felt blessed, however, to be back in the Masters after a two-year absence. "Six months ago I didn't know whether I would be able to play a tournament again and here we are on the weekend of the Masters," he said. "It's pretty incredible." Those at the top of the leaderboard will know that margins can close almost in the blink of an eye. As three-time Masters champion turned TV pundit, Nick Faldo, remarked: "Augusta is the most strategic, the most thinking course these guys will play." In the event, a celebrated venue continues to weave its magic, with a halfway cut mark of five over par being precisely the same as it was 20 years ago. Which means it has capably resisted the dramatic changes in golf-ball technology which occurred at the turn of the millennium. For all their success in improving golf equipment, beavering boffins have yet to find a way of making it easier for us to get the ball into the hole. The time-worn attributes of nerve and touch can still be tested to the limit by the most severe greens in the game. 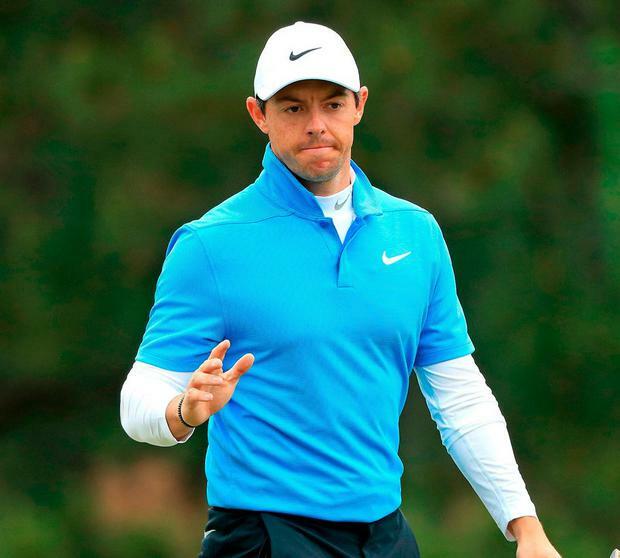 McIlroy has embraced this test in his thrilling tilt at history. Which should leave him ideally prepared for the rigours of a fearsome back nine, later today. I'm standing on the most famous tee-box in the world, water ahead darker and more ominous than the North Sea, a landing area behind it that looks as narrow as a fireside rug. Roy Curtis THE emotion was so uranium-enriched, The Tiger's Garden of Eden so drenched in tears, the wonder was that old Rae's Creek didn't swell up and burst its banks.